A good while ago I was asked whether I'd like to review POM Wonderful and use it to make cocktails and to make a video. I of course agreed as I love the stuff. After a while the kit and vouchers came through and the hunt for somewhere that sold the right bottles began. After a delay I found them both in Sainsbury's by where I play cards on a Tuesday and so then I took these home and planned what to do. The two large bottles are great, I could drink them neat, but this seemed to defeat the idea of the whole thing. Here is the kit. Lots of nice things, plastic glasses, a shaker/strainer and a pummelling stick. I didn't picture the recipe guide that came with it as I'd stuck this in my shopping bag to get some of the essentials. The main things I got were Blueberries and Apples and Ginger Ale. There were odd things like a nail of ginger that I didn't know what to do about, and lemon/lime juice which we already had (pancakes!) and I figured that I'd manage somehow. With all this set out and ready to go I really wasn't sure about the video aspect - I've tried to do video recipies reviews before and they all go horribly wrong and don't tend to get many views. I came up with a nice mid-range solution - I did a Vine video. These are videos that are 7 seconds long and go on their own specific site like Twitter. I made some heart shaped ice-cubes and videoed away. This seemed to work - the short video didn't get in the way of the making and there was no muffins to burn. 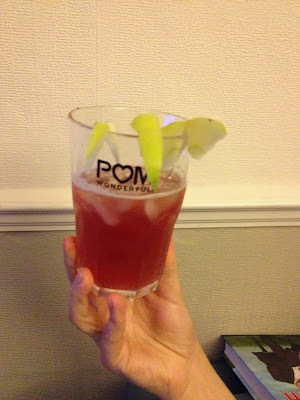 I made the Apple & Ginger and Pom which involved apples and lime and POM juice shook and blended with ginger ale and then strained into a glass with ice. I gave the result to my partner. She approved and so I made a second drink for me. 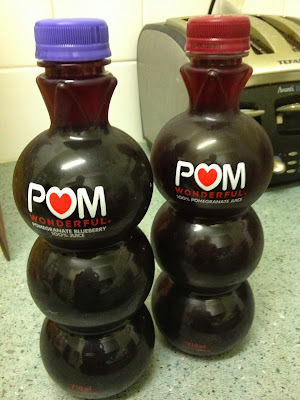 This was similar, but using blueberries as well as using the blueberry version of the POM. This was just as straightforward and I put all the bits of apple in from the shaker instead of adding new bits as garnish. 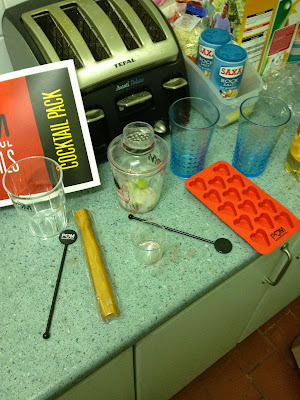 I also used the last of the heart ice cubes . The veggie sausages were separate. I think that large You Tube videos telling you how to make a cocktail are a lot less fun and immediate than cocktails should be. The little video gives you all the info and only takes a second (well 7) to watch - if I've embedded it correctly. 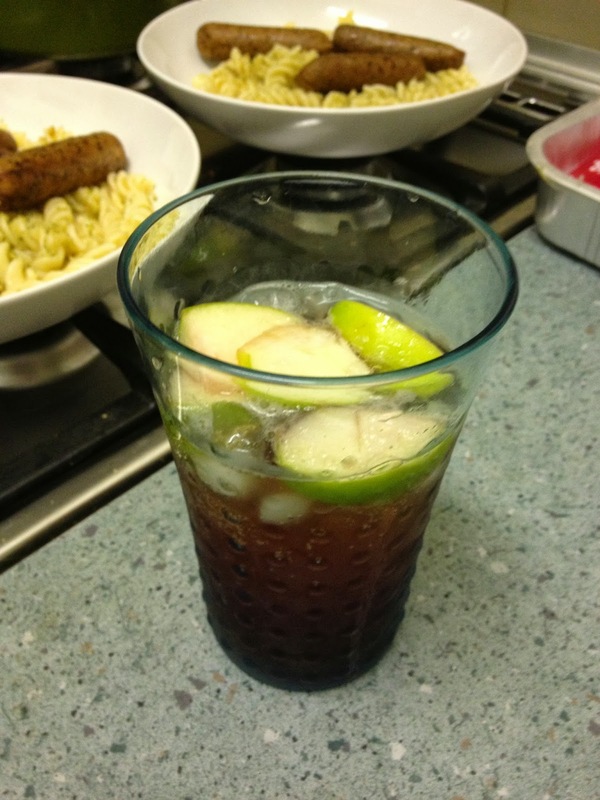 Since this I have worked my way through the rest of the ginger ale and POM as the combination really does work very well, but without all the extra bits and pieces and measuring. Taste really is the key here, and they are certainly a refreshing way to enjoy mixing things up a bit.